Walking out of Solar Power International into the soft afternoon light bathing the Grand Plaza surrounding it, a graceful orange structure called to me from across the space. As my eyes adjusted to the sunlight, I could tell that this beautiful tree was not topped with palm fronds or billboards but gorgeous glass-laminate solar panels. 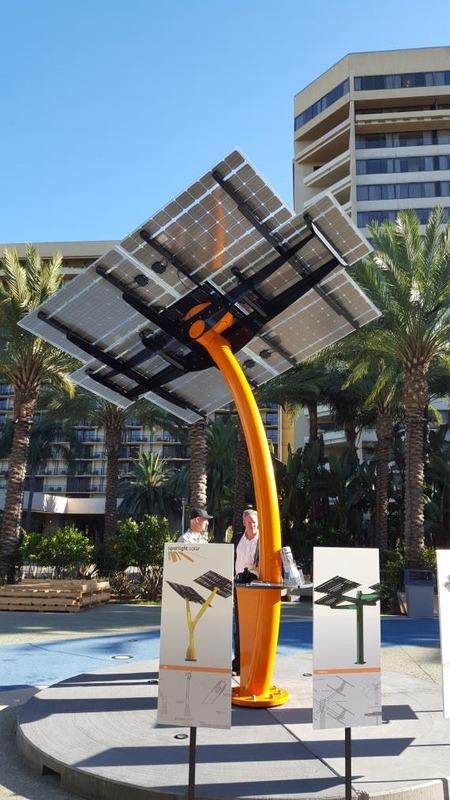 So effectively luring me across the plaza like the smell of fresh ground coffee pulls me from my slumber each morning, this artistic creation by Spotlight Solar achieved exactly what it was designed and built to do – to put a spotlight on solar. We recently featured a Spotlight Solar installation at the Tracy Aviary with two bright pink installations, which was a great example of how these unique creations can be used to send a message. Another great example of a facility that has made significant efforts to reduce its impact on the environment and used a bold Spotlight installation to tell its story is Sandy Grove Middle School in North Carolina. This school is not only reducing its environmental footprint through its green efforts, but its 590-kW solar system, geothermal system, and energy efficiency improvements all work together to make the school a net producer of energy. 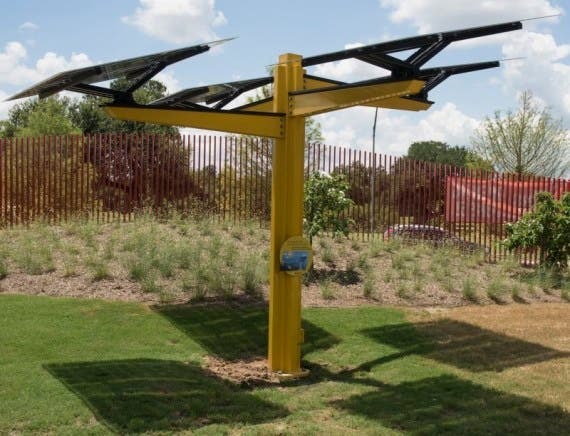 To ensure its powerful message was getting out to students, parents, and faculty, the school chose to install not one, not two, but four Spotlight Solar “Lift” structures out front of the school in bright blue to drive home the point. 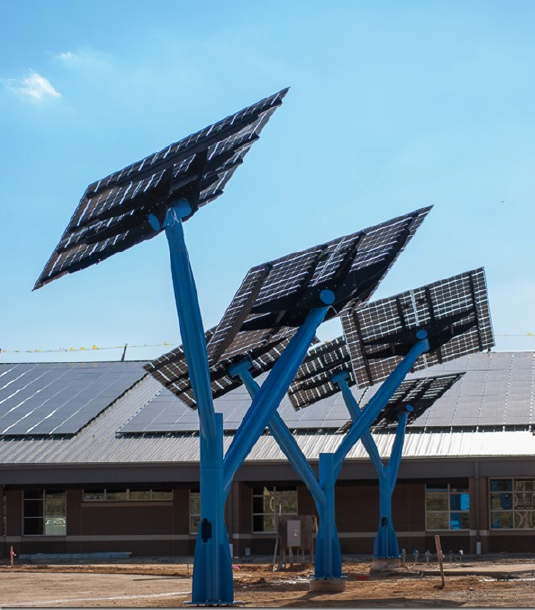 Spotlight currently has 3 variations which range from supporting 6 solar panels up to 12 panels for its “Lift” model, like those installed at Sandy Grove Middle School. The variety of models in custom colors allows customers to pick the right piece for their space to maximize the impact. Spotlight Solar installations can typically be put up in a single day and run from $30,000–50,000 per installation depending on the model, panels, inverters, etc — though, it’s worth noting that these beautiful pieces are not intended to be as “cost effective” as mounts for a stand-alone solar system, but rather, are purpose-built to call attention to other, larger sustainability efforts. Having said that, these fully functional, self-contained units would function just fine as stand-alone systems – if that’s what you’re looking for and don’t mind throwing down the extra cash.